We take a look at our top 3 weed killers to suit any budget. Weeds. Since time in memorial, these plants have been known to cause havoc on any garden, lawn, or fence. Weed seeds are always in the soil waiting for the perfect conditions to start growing. As they grow, they compete with your grass or tender plants for water, space, sunlight, and nutrients. Unfortunately, weeds can grab the available resources faster, outdoing your grass or young plants. If left unchecked, growing weeds can reduce soil fertility and significantly affect plant growth. Fortunately, with the help of weed killers, you can get rid of perennial and annual weeds. Weed killers are scientifically formulated to help deal with stubborn weeds such as dandelions, bindweed, black medick, and white clover. Effective on different types of weeds. 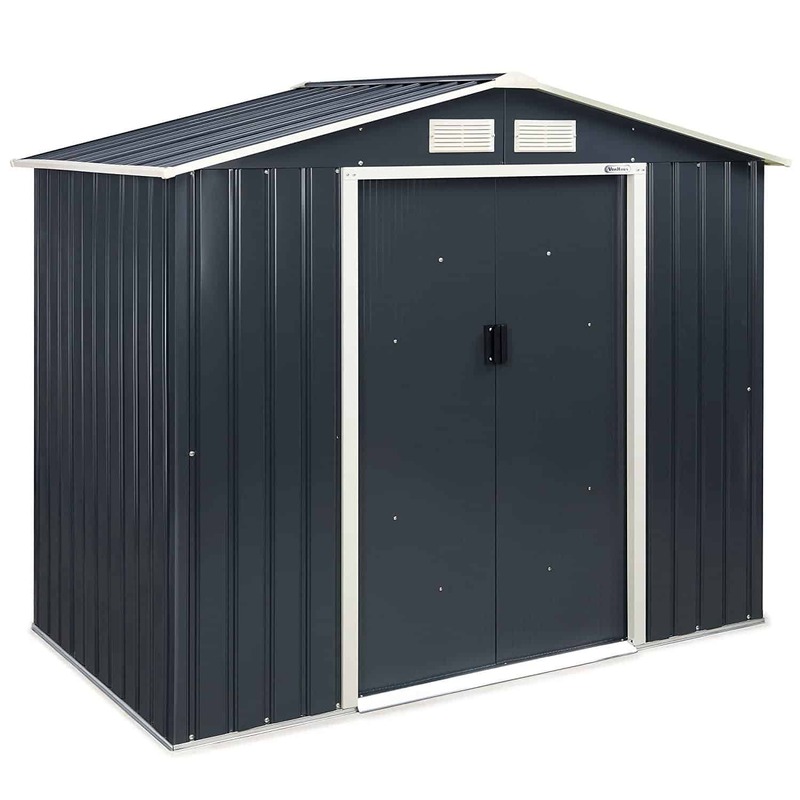 Withholds the growth of weeds for an extended period after application. Weed killer drifts could harm nearby plants. Prolonged use could lead to skin and throat irritation. For this review, we have selected the top 3 best weed killers. We look at what makes each herbicide ideal for use in your home. Some precautionary measures you need to take during application include wearing gloves and spraying when the weather conditions are calm to prevent drifts. Once you are done, do not empty the remnants into drains and wash your knapsack sprayer thoroughly. These weed killers are from renowned companies. They are reliable, affordable, and easy to apply. This potent weed killer by Elixir Gardens is one of the best available in the UK. The best part is that it is available online so you don’t have to go to the store. This weed killer is certified and contains 360l of glyphosate; this is the same amount found in most-professional-grade herbicides. Glyphosate is responsible for killing deep-rooted perennial and annual weeds. Some of the most common weeds this weed killer helps destroy are nettles, dandelion, grasses, docks, and willowherb. The application is simple; you need to dilute 24ml in one litre of water. 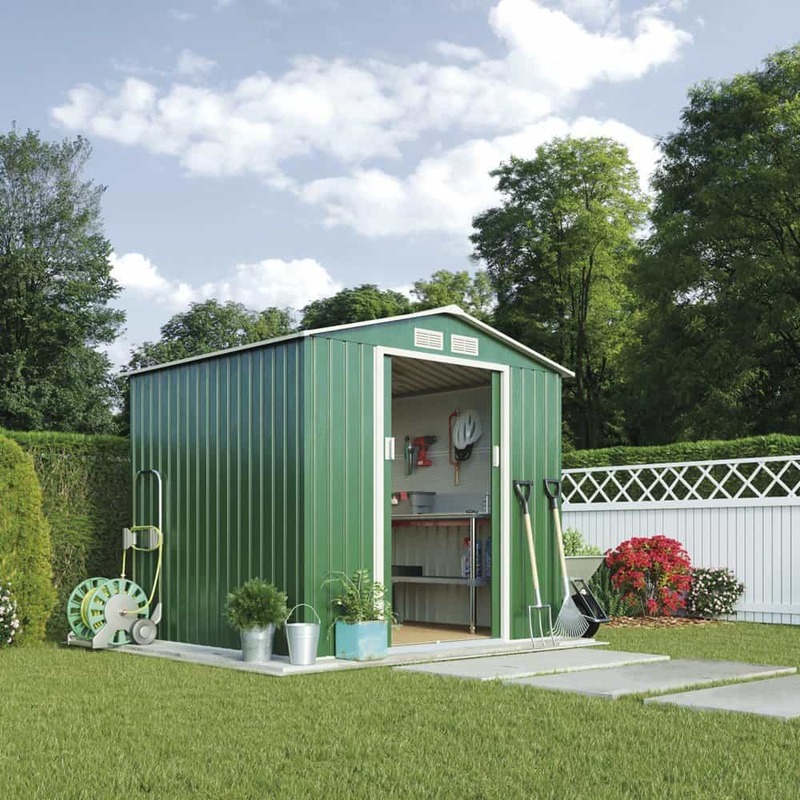 This solution is enough for 40 sq/m (0.4 acres). For best results, it is advisable to apply it on flowering weeds that have enough leaf area for absorption. You only need to use this herbicide once. On the day you plan to apply this weed killer, make sure the day’s temperature is at least 8°C. At this temperature, the weeds are growing slower but their uptake time is fast. You will see results a few weeks after initial application depending on the type of plant. 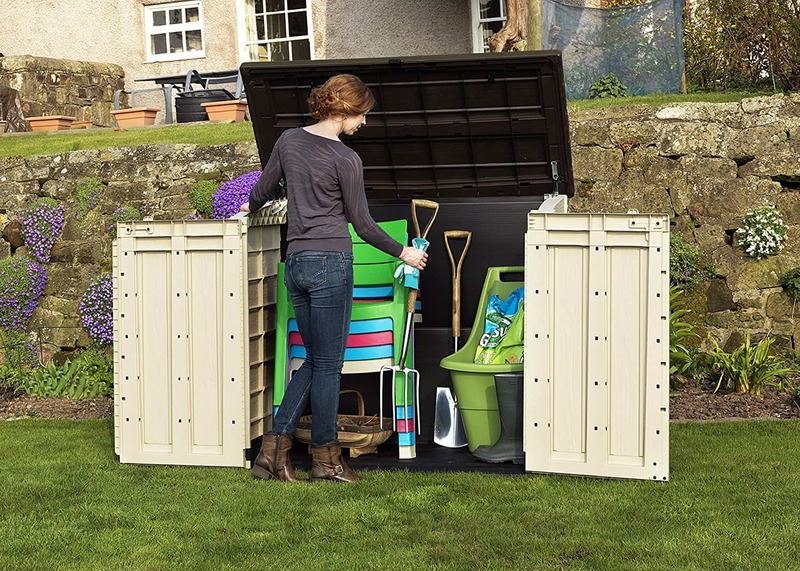 A two-litre bottle covers up to 3332 sq/m, which is more than enough for most English gardens. So, what effects does it have on your soil? This weed destroyer is harmless to your ground. If it comes into contact with the soil, it is immediately rendered inactive. You can even replant on the sprayed area after 7 days. Do not walk on the sprayed area until it dries. 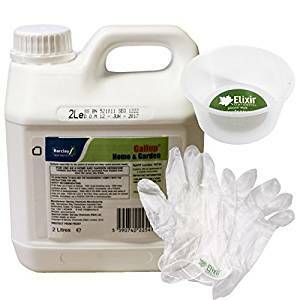 The Gallup weed killer comes with complementary gloves and a cup. You do not need a knapsack certificate to apply this weed killer. Does not stop weed seeds from germinating. The truth is, this glyphosate weed killer is one of the best you can find on the market. It kills almost every plant. 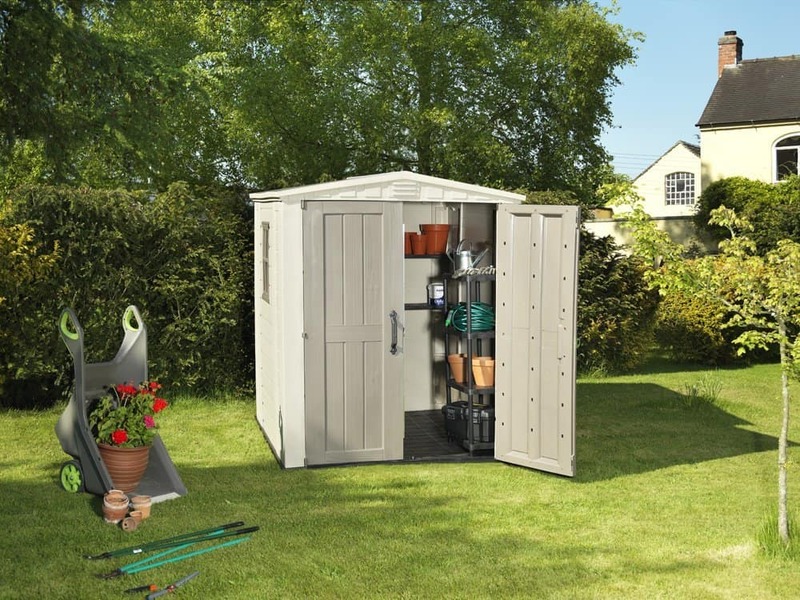 Most users have noted that it works best after the rain when the weeds uptake is high. If you have hardy shrubs, make sure to apply this weed killer severally to see excellent results. Use the sprayer at approximately 50cm from the weeds you are targeting. 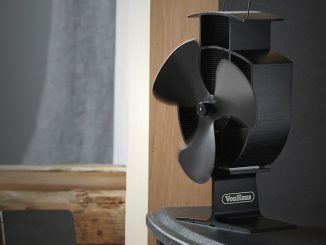 Once you are done, rotate the nozzle to “off” and turn the cap to closed position. Most users have seen remarkable results in 1-2 days after application. This herbicide is ideal for destroying ground-elder, bracken, nettles, and other woody weeds that most herbicides are unable to kill. You should use the Roundup Fast Action weed killer on drives, flower beds, patios, paths or when edging lawns. You can also use it to clean up weedy ground before you plant flowers, vegetables, trees, and bushes. This herbicide is also ideal for renovating overgrown areas. Do not use this product on your garden or lawn; it will kill the grass and plants. Just like other herbicides, the best time to use the Roundup weed killer is when weeds are blossoming. In case it rains within 6 hours after application, repeat treatment. Make sure during application the weather is calm to avoid the drifts to other plants. Covers up to 90 sq/m. Degrades fast in the soil, allowing you to replant. Not ideal for use on gardens and lawns. Using the sprayer for too long may hurt your hands. Are weeds chocking up your lawn? 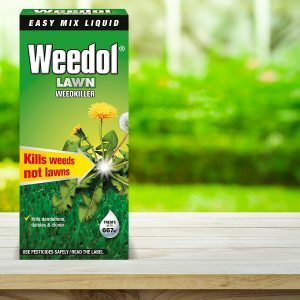 The Weedol Lawn Weed killer is designed to completely kill the weeds on your lawn without harming the grass. 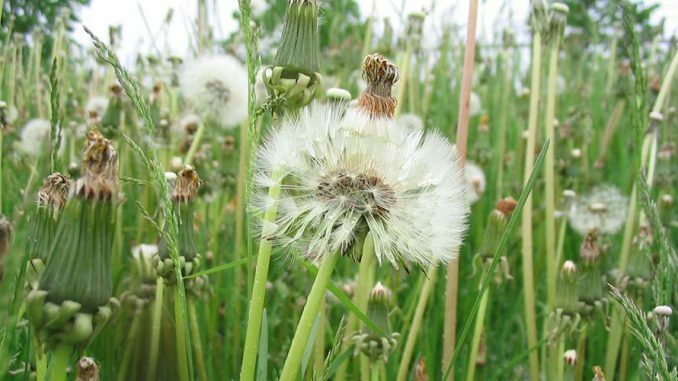 This product gets rid of weeds such as black medick, plantain, mouse-ear, daisies, and dandelions. It kills these weeds after one treatment. So, how do you use this product? For treatment, you should measures 15ml then mix it with 5 litres of water. You can use a knapsack sprayer or a watering can. Make sure to clean the sprayer or watering can thoroughly after use. This mixture is enough to cover a 10 sq/m lawn, and the 1-litre concentrate bottle can cover up to 667 sq/m. This herbicide works by stimulating rapid growth of weeds. The weeds are unable to sustain this growth rate and they end up dying of exhaustion. Clever, right? You should apply Weedol Lawn weed killer on your lawn only. For excellent results, make sure to spray between April and December. This is the period when weeds are actively growing and have broad leaves. Also, do not mow your lawn three days before or after treatment. For new lawns, spray during spring or at least two months after laying turf. Do not let the herbicide come into contact with any cultivated plants. Also, after the first mowing, leave the grass clippings on the lawn. You can compost grass clippings from the next mowing. 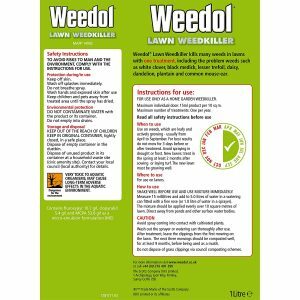 Weedol Lawn Weedkiller contains MCPA, clopyralid, and fluroxpyr. These chemicals make it one of the most potent herbicides on the market. Scientifically formulated to kill weeds. Does not harm the soil. Weedol Lawn weed killer does precisely what it is designed to do. Most users say that they have used this herbicide for years. You need to apply it once to see results. However, if some weeds are stubborn, you can reapply after a week or do a spot treatment. This top-rated herbicide contains three potent chemicals that kill different types of lawn weed. Another great reason why users love this product is the manufacturer’s instructions. You will get clear instructions on where to use it, when to use it, and the best way to apply it to your lawn. 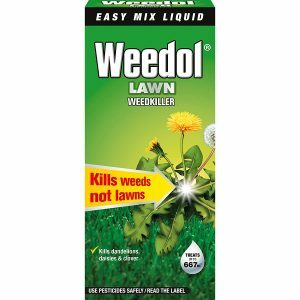 With the Weedol Lawn weed killer, you will never see those unsightly weeds. The best weed killer among the ones listed above is the Elixir Gardens Gallup weed killer. This herbicide contains glyphosate. This potent chemical is known to destroy stubborn weeds like bindweed and nettles. A 2-litre bottle of Gallup covers more ground than its counterparts. 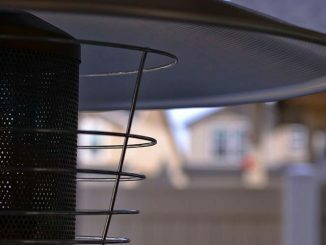 Users rate this product highly because of its ability to destroy weeds within a few days. And the best part is, you can replant 7 days after application. Remember to keep away children and pets from the sprayed area until it dries. Weeds grow and spread fast. 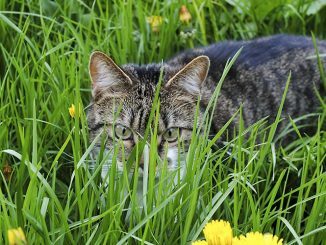 If you do not act quickly, your lawn, garden or patio could be overrun with these plants. It is even harder to get rid of fully grown weeds, so you need to act now. 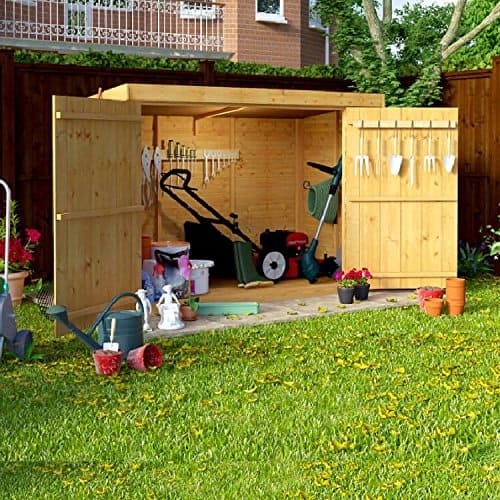 The weed killers listed above will help you get rid of different types of weeds. When you get your herbicide, follow the laid out instruction carefully and wait for amazing results within a week. Remember to keep the herbicide away from pets and children. 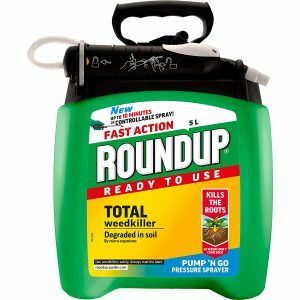 In this review, we believe you will find a potent weed killer that will help you clear out weeds.